Namaste Trustworthy Truth of Transformation! So it is that I am here on Transformational Tuesday, the 1st of 13 left in 2018. Truth is, I am just called to commit to this so I am. Maybe it is a needed gateway to get me back into social media in general ~?~ or perhaps through a bit of dedicated discipline, this little series of 13 Transformational Tuesdays will be of service to someone or someones besides me?! Truth can be illusive yet a necessary foundation to well being. Thereby, we begin with truth. And trust. In the era of fake news, we are collectively more focused on truth these days. National and global dramas can pull us in to a swirl where lies seem more prevalent than truth sometimes. I have been astounded over and over how people I respect believe things (politically) that to me, seem to be blatant lies. As spiritual beings in this human experience, we must constantly tether to what is true for us personally and then hold the highest vibration we can for others and for the collective. When we are rooted in the light filled truth in our hearts, we bring a higher perspective to the table. While we find our spiritual truth in our hearts, it is our minds that often must do the work to allow the natural progression of transformation, aka FREEDOM from pain! Today’s tool is Byron Katie’s The Work available in this free PDF. Katie discovered her suffering was attached to whether or not she believed her thoughts. Hence, the work begins with the question, “Is it true?” Like all truth, “The Work” must resonate with you for it to be a tool you will use. We know that thoughts create our reality so if we do not like our creation, thought is a great place to start! And! We can’t ever forget the power of our hearts for trust, truth, transformation. Whatever we continue to be called to, is our truth. If the calling and truth feel good, feel like Love, than we are surely home in our heart truth … and ultimately remembering more of the truth of our being! I continue to be called to my own work and to share it here. Here is a bit of the Farm Day I invited you to here in the September blog a few days ago … our Feature Creature Teacher, Peacock hid most of the day yet I got the pictures below and Tina the emu was a favorite for her loud, thumping drum-like heart beat. All ages had a restorative, fun gathering! More pictures here. Our October Leaping Literacy Library Free Shelf is stocked with lots of transformative goodies including 3 songs from the new CD! We will be offering lots more freebies this month during the 13 days of Halloween. YAY! Let’s play! Thank you so much for being here in the Spirit of truth, trust, transformation. May the thoughts of your mind and your heart guide you well into ever more fullness of your yesness expressed. Namaste, Love! 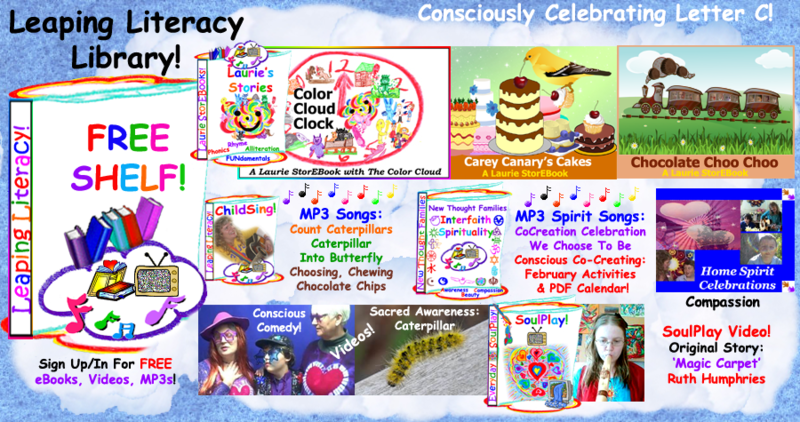 Awareness, Acceptance, Allowance: Being Conscious! Namaste Awake and Aware Allowing, Accepting Ones! How you BE this conscious moment?! I greet you in the names of acceptance and allowance with a big breath of beautiful, bountiful becoming and creativity caressed compassion awareness. As the first month of 2018 draws to a close, I find myself here with too much to say and a dedicated determination to align with the shine of my divine design to the best of my capabilities at this time. In less poetic terms, I am accepting and allowing messy me to post here less than perfectly according to my 2018 plans … for humanity! Today is the scheduled 3rd post of the year with the courageous, compassionate Letter C. And since Abundant A & Beautiful B were swept away in my January days, we will (eventually!) hear from each of our sacred ABCs this fine day. Today, the POTUS of our fair land gives his 1 year anniversary State Of The Union Address. I am choosing not to tune in as I have heard more than enough and will hear some highlights later, I’m sure. Instead, I revisited some January pictures and a new song born out of the Martin Luther King March For The Dream and the 2nd annual Women’s March. I put prayers to feet in both of them locally with my 17 year old son. In the Women’s March, he brought his guitar and we sang some ~ lots of ‘This Little Light Of Mine’ easily drawing verses from the myriad of colorful, creative, passionate signs. Here’s some pictures in a little video where I am singing a new song I wrote this month with pictures from the 2 marches; one voice, many feet! The voice is rough yet so is the journey! There are also a few pictures starting near the end from around the world curtesy of generous photographers at Pixabay. 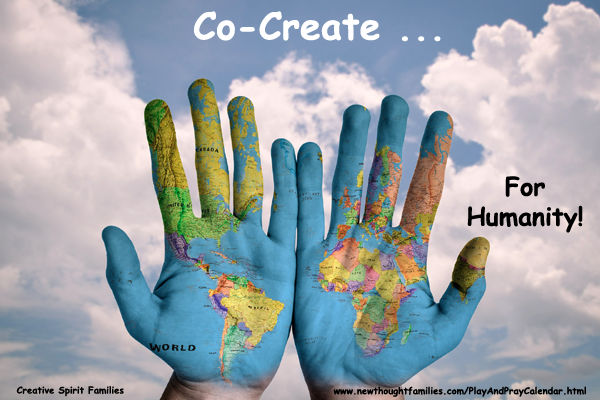 Ask: What is mine to co-create? Affirm: I Am that I Am the Co-Creator of my life! Keep consciously creating today ~ whatever your heart is calling you to. Ask your heart what it wants to create … a picture? A song? A new idea? If you feel happy and excited ~ or even a little scared, it’s probably yours to do. So speak the first word of it, make the first line … know that all of creation is with you to help co-create your goodness! 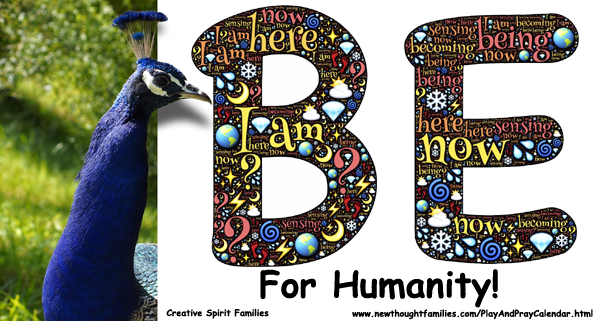 Yes, our ‘For Humanity’ calendar and focus on our ABC’s is back for 2018 after turbulent 2017. Our Leaping Literacy Free Shelf is set to change every 2 weeks in keeping with the calendar and with this blog. Um … about that … it has taken me all of January to get some mojo back after the TOO MUCHNESS of last year … and well, the To Do’s never really stop with a roll of the calendar year! Last night was a major fundraising concert for Jeremiah’s high school concert and jazz bands so of course I had my hands and feet in that … finishing strong! My boy turns 18 in a few weeks and off to college in a few months so between him and the elders, my time continues to be streeeeetched! Yet! Here we are! So let’s embrace those sacred ABC’s! A! Activating abundance through appreciation awareness! There are many ways to practice awareness ~ from self to society. The marches are a great expression of awareness. When we turn our awareness to appreciation ~ in presence and practice, life becomes a bigger celebration! 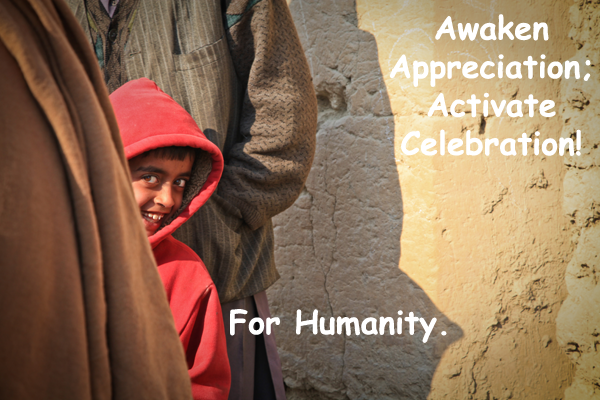 When we appreciate, we activate more and more of what feels good and calls us to celebrate! Appreciate the air, your hands and what they do, your loved ones, your neighbors and community. The more practiced we become at appreciation, the better able we are to appreciate even the things we don’t especially like ~ for their place in the divine whole. And even if your awareness can’t accept that one, know for sure that appreciation will undoubtedly raise your vibration keeping you happier, healthier and more prone towards celebration. Thereby better able to accept and deflect the atrocities and more readily allow your heart to awaken into more of the truth you truly be! This month at Spiritual Life Center, we practiced being awake and aware. We talked about being the kind of awake that opens our hearts into knowing more of the divine essence we truly be. Our Feature Creature Teachers were Bear from the dreamtime cave reminding us that in the stillness, can be the greatest awareness. Snake taught us to be aware of what we need to let go of ~ shedding the old so we can embody the new. Ant reminds us to be aware of each other ~ what is ours to do in community ~ with patience and strength! And last Sunday, we soared with Eagle who sees the big picture with sharp eyes teaching us to see our highest and best and to aim high where we build our nest. In being aware, our mind is a nest, our heart is a nest … we can aim high by nurturing them in the high vibration of appreciation! Use the tool of appreciation to center and re-center in the goodness and blessings of your life. I promise the more you use it, the more it will become 2nd nature! Yes we are blessed … so enter Letter B! 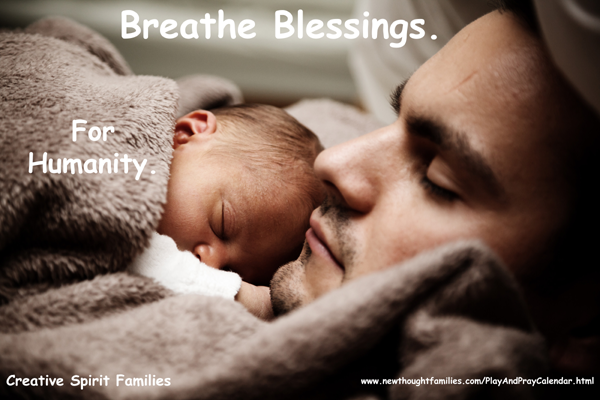 Our breath is the built in tool for centering into our blessings. Taking a deep breath in any moment can calm us down and help us cope. There are many ways to use the breath and any yogi will tell you, they all impact the body, mind and spirit differently! I learned the “breath of grace” years ago listening to Sonia Choquette and I still love it! Try it! Just blow out like you are blowing out the candles on your birthday cake … yes? Yes, blessed! Our holy Creator birthed us with a breath of Love and we can rebirth ourselves any and every moment! Our Creator also gifted us with a beautiful planet. Beauty is always beckoning for us to behold! Beauty is a way we can align with the divine design of this world and of ourselves. The flowers above are China Lilies also known as Narcissus which refers to being a narcissist which in this case I choose to see as a positive. These are my favorite flowers for their cheery appearance and intoxicating fragrance. They courageously bloom early; there have been lots around here this January. Their bountiful beauty beckons us to behold their beauty as a mirror to our own (hence the story of the narcissist associated with them). As this brief bout with B shows, it’s all what we believe! If we bring our sacred awareness into play, we will perceive the beauty in our surroundings and feel the blessings! Conscious Co-Creation! Of course, all of our spiritual tools are always available. Some days or weeks we have great self mastery in using them. Other times, we fall back into forgetfulness. Courageously on the path, we just realign our consciousness as often as we can and then put conscious compassionate action into our feet, hands, and plans! My own plans seem in slow mo yet these last weeks have been about chipping away at lots of unfinished business ~ like finishing 20+ alliteration titles for the Leaping Literacy Library! It’s one thing to create them yet without the formatting and publication, there’s no way to communicate them. 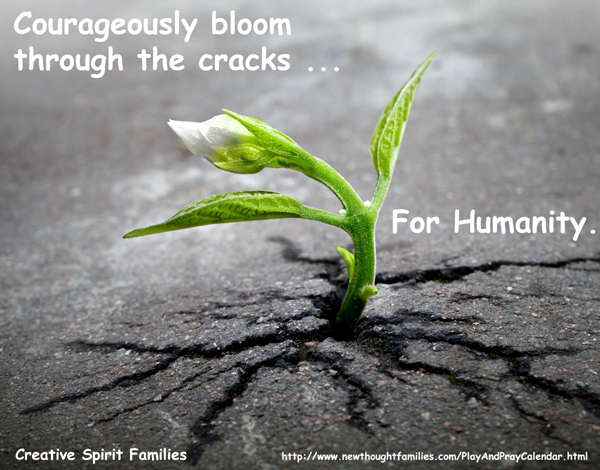 My co-creation celebrations require a lot of compassion … and the courage to just keep blooming through the cracks! Well, my Love, this long post has rolled over into the absolute last day of January! A blue moon night, we will have no full moon in February and 2 in March making for another blue moon (the blue moon refers to the 2nd full moon in a calendar month). This beautiful planet is ever ready to bathe us in beauty even though we continue to be broken as humanity. Yet! We also continue to awaken and to be aware, to be compassionate and to care. We continually rise … march, speak, reach. Thank you. I truly Love and appreciate you. For being here. For being there. For being awake and aware. Whatever you are co-creating this day, this week, this year, keep believing in the blooming of your beauty … breathe it in … ah … Namaste, Love! Connected Kisses This Memorial Day! I greet you in kindred connection to the kind core that lives in each of us and all of us ~ especially on this Memorial or Decoration Day here in the U.S. where we honor those who have died in war. My mother grew up with Decoration Day being a time to place flowers on the graves of all family members; to remember all those no longer here. My mom remembers picking wild flowers when they were fresh and storing them in 5 gallon buckets under the house for a week sometimes before Decoration Day. Somehow this image of the mindful remembrance and co-creation of my kinfolk, seems to make my heart smile and make me feel more akin to the holiday. Caring Kisses! Though this holiday weekend means many things ~ including BBQs and an ushering in of summer (though Solstice is still 3 weeks away! 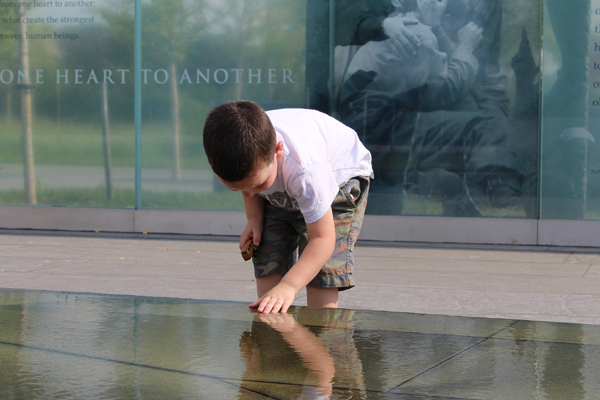 ), it is most widely an honoring of those lives lost and damaged in war. I’ll be taking my dad, a WWII vet, to a ceremony and lunch at our local Veteran’s Hall. Last year at this event, the Chaplain’s extra long ‘prayer’ included what I found to be hate speech against many in our American (global) family. So, I am resisting returning there again yet I am still willing to be in service to my dad; in this case, for his service to our country. And I am willing to be in service to Love, kindness, justice, allowance, remembrance … Kisses Of Remembrance! Memorial. A time to remember. Where we honor our ancestors and bring forward some of the past into our present and ultimately our future. Hopefully, generations to come will heal the insanity of humanity that is war (Eckhart Tolle) and more fully embody the inherent freedom that exists within us as both the truth and possibility of humanity. And by us remembering this essence of who we truly be, we make each day, an opportunity to live remembrance … in active Love and service, allowance and forgiveness, compassion and kindness. Kisses Of Kindness! We attended a graduation celebration yesterday for a wonderful young woman who has always embodied kindness and service. Sara sang on many of our CDs and it was fun to see her and Jeremiah together … our kids are such a kinesthetic marker of time! Sara has upcoming service projects this summer that include building a house in Mexico, helping handicap children ride horses in Idaho and feeding the hungry in central California. She continues to keep connecting in kindred kindness in answering the callings of her heart. Jeremiah and I then returned to our old church this morning in their (not so) new location we had never been to. This was the community where we met Sara and sang together. The church continues to “Love, Serve, and Remember” and it was a gift to rekindle some old connections with kisses of caring kindness. Kinfolk Kisses! My own Jeremiah is wrapping up school this week: some tests still await ~ including his driver’s test. Gulp. It’s here, my son, the licensed driver. This week also includes a long drive to my nephew’s graduation, the local graduation (Jeremiah’s on French horn for pomp and circumstance!) 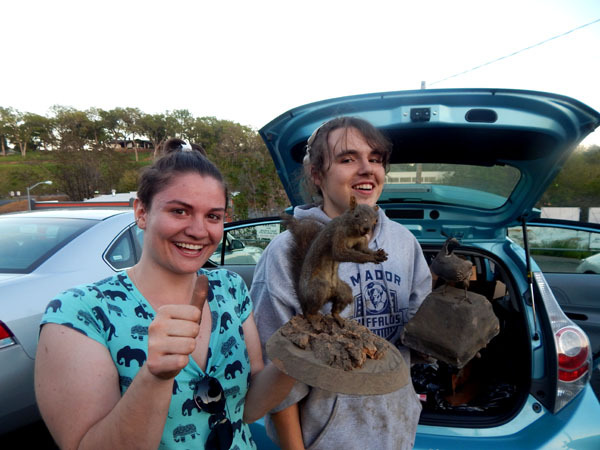 + I am hosting a little cast party one day after school at 14 Main ~ the dusty old family store some of the drama kids did the one act play about this year. And! 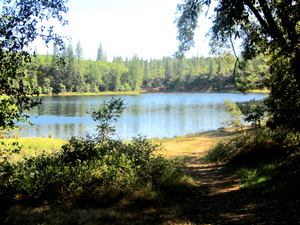 Next Sunday, our Creative Spirit Families’ local PlayShop is at beautiful Lake Tabeau ~ woo hoo! 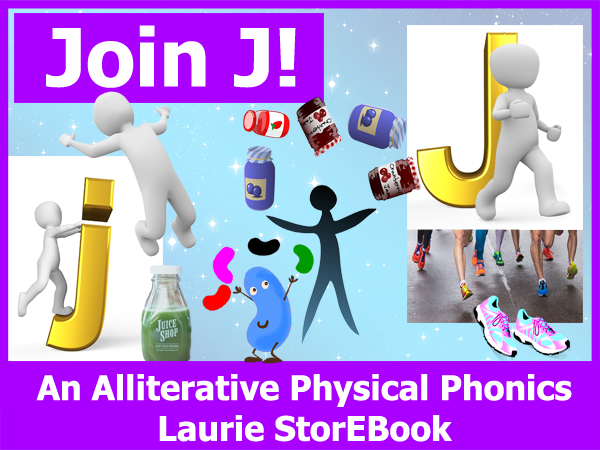 So lots of continued, blessed busy-ness, as my little Laurie StorEBooks (the most joy filled calling of my heart!) are still being birthed. Committed Kisses! In the midst of keeping commitments and connections with kin that include all of the above + a whole lota blessed birthday celebrations and some local performances this June, I will be sending my teenager off with free wings and a big sky the summer. Jeremiah is going to Spain on a school trip and when they come back to the States into Dallas, he will board another flight to Philly to be with his dad. They will drive nana’s old car across the country so my licensed driver will have his own wheels next school year. (More free wings for mama too!) Jeremiah will also return to band camp at Lake Tahoe for a week before school resumes in August so my free bird will be covering lots of sky this summer! Me? I will still be caring for dad while having a bit of a staycation at home. I will be kindling co-creation playing with a huge ABC project and production list. 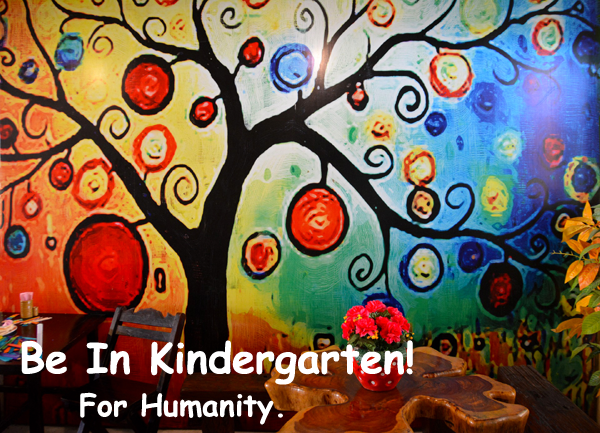 I plan to go back to kindergarten ~ with a playful heart and an open, learning mind! Kisses Calling! What summer adventures are calling you and yours this season?! How about joining us in the sacred Sierras for fun, frolic, feathers, conscious, caring community and heart opening, empowering connections with self, family, friends, nature, creativity, spirituality?! Kindred Kisses! Our hearts are always calling us home … to kindred connections of kindness, creativity, compassion, justice. We know what’s right and fair for ourselves and our family. In spiritually parenting myself, teenage Jeremiah and elder dad, things may often feel unfair or ‘wrong’ yet I have come to know the opportunity in those feelings to go deeper into divine order where kindness and justice reign supreme ~ always and in all ways. With Jeremiah in particular, I see the power of conscious connection that we have nurtured together. I heard a great term this week from an unidentified source, that the teenage experience is “dirtying the nest”. So true ~ in more ways than one! Yet awake and aware consciousness allows us to keep Spirit/God in the forefront helping us to navigate sometimes turbulent teenage waters with conscious kindness. The natural give and take of him growing up gives me just enough “Ok, go ahead and take your mess with you” to balance out the tears and sadness in spending the summer without him. I actually feel happy for him and for me ~ for the most part! Leaping Literacy Kisses! As promised, we added K to J for the fleeting days of May on the Leaping Literacy Online Library Free Shelf. In the upcoming first days of June, we embrace the light, life, and Love of L! 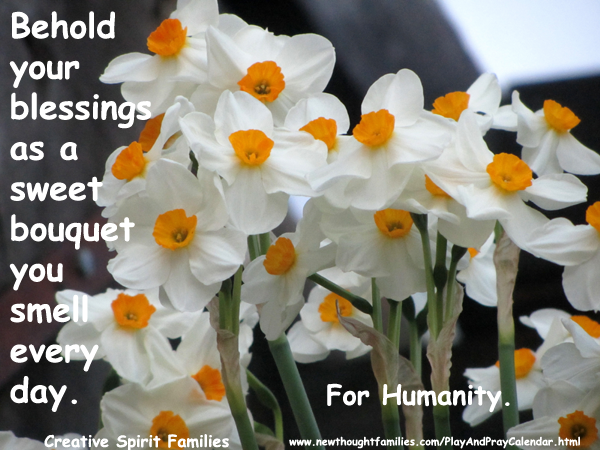 Remember, you can play & pray with us every day on our New Thought Families Daily Play & Pray Calendar. Kindle Kisses! And so it is we carry on in kindling moment by moment kisses. 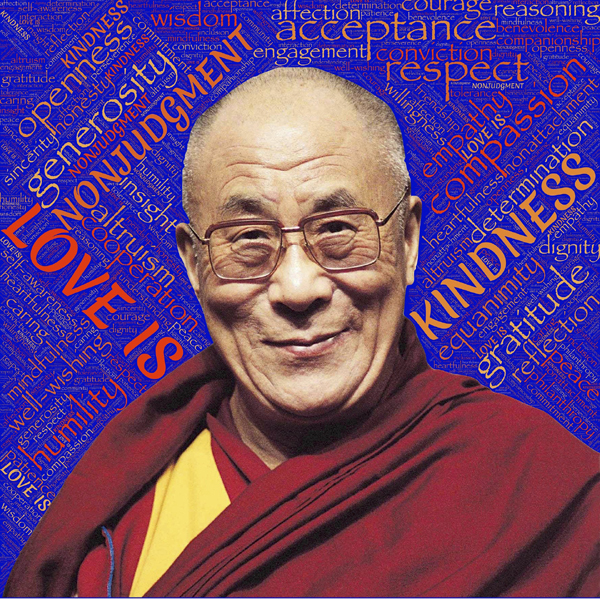 Kisses of awareness, goodness, justice, kindness, togetherness & tenderness, reverence & remembrance. I send you a grateful kiss of yes in this blessed moment with a reminder invitation to carry kindness wherever you go … Namaste, Love! Namaste Free Spirits! Join Us!